If you are interested in pursuing a career as a Professional or Apprentice jockey, you should firstly discuss your options with your employer who will be able to help you decide the most appropriate licence at this stage of your career. Before making formal application, the Licensing Committee strongly advise you to read the application notes carefully and, if you are in any doubt at all about what is likely to be involved, you should also have a preliminary discussion with the Licensing Department at the IHRB, either by correspondence, telephone or personal interview, before committing yourself to any expenditure. All first-time applicants must be 16 years of age or over, and for a Professional National Hunt licence you will ideally have gained experience as a Qualified Rider (amateur) or as a Professional jockey in another jurisdiction, and will have a reasonable level of experience. Applicants are interviewed by the Licensing Committee or their designate, and may also have to complete a pre-licensing riding assessment. Applicants must also complete a medical examination and baseline concussion test. Apprentice jockeys applying for a licence for the first time should not weigh more than 9st (126 lbs). The application is made jointly by both trainer and jockey. Applicants must also be issued with a ‘minimum riding weight’ (MRW) before a licence is issued. There is a 6-week procedure to obtain a MRW and this involves meeting with the IHRB dietician on two occasions. Once a licence is issued, apprentices are initially ‘indentured’ to their employer for a period of 3 years and the terms and conditions of employment are defined in a ‘Deed of Apprenticeship’. Professional Jockeys applying for a licence for the first time should not weigh less than 9st 7lbs (133lbs). The application must be supported by at least two licensed Trainers who are willing to verify the competence of the applicant and also be in a position to ’guarantee rides’. Applications should be made well in advance of when you hope to ride as all applicants are interviewed by the Licensing Committee, who convene approximately every 6 weeks. If you are granted a licence, you may be restricted to your employer and/or from riding in Steeplechases until you gain suitable experience. New jockeys must also ride in three Handicap Steeplechases before being eligible to ride in a Beginners or Novice Steeplechases. For further information, please download the application form from our website or contact the Licensing Department by email: licensing@ihrb.ie or telephone 045-445605. There are three categories of Qualified Riders’ permits – Categories A, B and C. All first-time applicants are only eligible to apply for a Category A permit. Category (A) permits are further sub-divided between Category A1 and A3. Those applying for a Category A1 must be 16 years old and those applying for a Category A3 must be 17 years old. 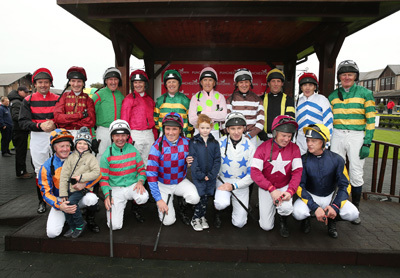 A Category A1 permit allows you to ride in Irish National Hunt Flat Races (Bumpers and pro-ams) only and flat races in which Qualified Riders under Rule 135 are permitted to ride. A Category A3 permit allows you to ride in all races that a Category A1 permit holder can ride in as well as in Point to Point Steeplechases. To be considered for a permit, all Applicants must first undertake the Practical Test/Assessment to ascertain the level of their riding abilities. This assessment takes place at the Racing Academy and Centre of Education (RACE) in Kildare town on a designated date. The assessment will be conducted by two Instructors from RACE and one IHRB Racing Official. If you pass the Practical Assessment, you must then attend the Qualified Riders Course Day. This is lecture based and again takes place at RACE. Lectures cover such areas as the Rules of Racing and Health and Safety. You must have a detailed knowledge of the Rules of Racing and INHS Rules that are applicable to you as a Qualified Rider. Upon successful completion of both the practical assessment and the course day, a medical exam by an IHRB nominated doctor, a baseline concussion test and the opening of your Horse Racing Ireland account must also be completed before any permit can be issued. Further details of the baseline concussion test will be supplied once you have successfully completed your practical assessment. For more information on the Concussion Assessment, click here. Assessments are held approximately every six weeks. To be considered for assessment, a completed application form and medical questionnaire must be returned to the Licensing Department at the IHRB. Applicants should have a minimum of 10 rides before consideration will be given for an upgrade from Category A3 to Category B and a further 10 rides before consideration will be given to upgrade from Category B to Category C. It will not be possible to upgrade directly from Category A3 to Category C. Applications for a Category B permit will only be considered from those that have ridden in point to points. This may be reviewed upon proven ability. A Category B permit entitles you to ride in those races listed under A3 plus Hunter chases and Hurdles & Chases confined to Qualified Riders. A Category C permit allows you to ride in all races open to Qualified Riders unless the race conditions specifies otherwise, plus 21 races open to professional jockeys in any one season. If you ride a horse owned by your immediate family in races open to professionals, such rides will not count against the 21 rides allowed against professionals. All upgrade applications are considered and approved by the Licensing Committee. The licensing year for Qualified Riders starts on the 1st September and ends on the 31st August each year. The Racing Academy and Centre of Education is a training academy for the Irish horseracing industry offering courses for jockeys, stable staff, racehorse trainers, breeders and others involved in the thoroughbred sector. The IHRB employ RACE to deliver educational courses for current and prospective Licensees. They are based in Kildare Town. Riders and all Licensees are reminded that they have an obligation to familiarise themselves with the Rules of Racing and all relevant policies and procedures and to update themselves on a regular basis. Ignorance of the rules is not a defence to non-compliance. To assist riders, we have created this document for reference and included specific rules. However, you should be aware that this is not an exhaustive list of rules and riders must ensure that they are fully aware of all their obligations and responsibilities. All amendments to the Rules of Racing and Irish National Hunt Steeplechase Rules are published in the Irish Racing Calendar and on the website of the IHRB. Please click here or on any Rule number to access the Rule Book. Professional and Apprentices Jockeys not allowed to own horses. Responsibility of a Rider to acquaint himself with procedural guidelines and with all banned substances and banned methods. All Overseas riders must report to the IHRB Medical Officer on duty when they arrive on track. Under Rule 198 (v), any Body Protector you wear must meet the minimum standard allowed which is EN13158:2009 Level 2. It is not permissible to have an attachment between the Body Protector and the saddle or girths. All Body Protectors must be worn with a harness (crotch strap) in all races. It is a breach of the rules for a Body Protector to be modified in any way and it must be in a serviceable condition. In addition to wearing a Skull Cap and an approved Body Protector, all Riders when mounted on horses must have their chin straps properly adjusted and fastened at all times. Failure to comply with the above order may result in disciplinary action being taken by the Stewards. (a) Have a CE marking. (c) Have a full liner made of polystyrene or similar impact absorbent material. (d) Must not have a chin cup, cradle or draw lace. (e) The chin strap must pass under the jaw and be attached to the harness by a quick release buckle. Metal hooks are expressly forbidden. (f) Must be of the correct size for the individual Rider; the face harness must be correctly adjusted and the chin strap fastened at all times when mounted on a horse. Riders should also note that as Skull Caps are designed for “single impact only” any Skull Cap which has been subjected to a severe impact or has been worn by a Rider suffering concussion should not be regarded as serviceable and should be replaced. Under Rule 198 (iii)(b), only stirrup irons which have been manufactured from aluminium, carbon fibre, steel, technopolymer or titanium are allowed be used. The hitting of a horse in front of the saddle while the whip is held in the forehand position, unless exceptional circumstances prevail. The unnecessary hitting of a horse after its chance of winning or being placed is clearly gone. The unnecessary hitting of a horse that clearly has its race won or has obtained its maximum placing. The hitting of a horse after the Winning Post has been reached. The hitting of a horse other than down the shoulder or on the hind quarters. The hitting of a horse with excessive force or frequency. Having used the whip, the rider should give his mount time to respond. (b) whether the number of hits was reasonable and necessary over the distance they were given, taking into account the horse’s experience. The Stewards have been instructed to bring before them any Rider who appears to have used the whip in any of the forbidden ways. If the Stewards are satisfied that a breach has occurred, then the matter will be dealt with in accordance with Rule 14(i) and (ii). Where Stewards are satisfied that riding instructions given by Trainers or Owners have contributed to a breach of these Regulations, then such persons will be liable to disciplinary action in accordance with Rule 14(i) and (ii). In the investigation of alleged breaches of this Regulation, the Veterinary Officer will be asked to clinically examine the horse. The use of spurs while riding in a race is absolutely forbidden. (b) Any Rider who currently holds a licence or permit to ride issued by a foreign Turf Authority shall be entitled to ride in any race under these Rules for which his licence or permit would qualify him to ride, if it were being run under the Rules of the Turf Authority which issued his licence or permit, subject to such restrictions or conditions as the Licensing Committee may consider appropriate. (c) A Rider shall not ride on any Raceday on which he has been suspended from riding by the Stewards, the Referrals Committee or the Appeals Body, subject to the provisions of Rule 270 or on any Raceday which coincides with a race day in a foreign jurisdiction on which he has been suspended from riding by the foreign Turf Authority, subject to the provisions of Regulation R18. (d) The Directors of the IHRB in their absolute discretion may refuse to permit a Rider to ride in Ireland who holds a licence to ride issued by a foreign Turf Authority which has not agreed to implement in full the provisions of Article 10 of the International Agreement on Breeding Racing and Wagering. The IHRB carries out drug and alcohol testing at some racemeetings. Riders are randomly selected for drug testing. If alcohol testing is taking place, all riders will be required to pass a test before being allowed to ride. Further information on drug and alcohol testing is contained in Regulation R7 or on our website here. Foreign riders should also familiarise themselves with the rules pertaining to riding in Ireland which can be found under the ‘Jockeys Obligations (main rules)’. Also, upon arrival at the racecourse on the day of your intended engagement, please inform the Stewards Secretaries on duty. They can advise and answer any specific questions you have in relation to the relevant rules regarding starting, marker poles and general race-riding rules. Drug and alcohol testing of jockeys is carried out by testers who are contracted by the Irish Horseracing Regulatory Board to provide the service. The emphasis in racing is on testing jockeys for any product that is performance impairing (e.g. alcohol, cocaine and cannabis). Therefore, the focus is on providing a safe environment for competition in one of the most dangerous of all professional sports. Any impairment of performance could not only pose a serious risk to the safety of the jockey concerned but it could also put other jockey’s lives at risk. Testing days are split between urine-only testing days and breathalyser-only testing days. On urine testing days, up to 10 riders are selected and the urine is tested for banned substances and methods listed in the World Anti-Doping Code Prohibited List. On a breathalyser testing day, all the jockeys riding at that particular meeting will be tested , and anyone failing the test will be stood down from riding for the day and the rider may be referred to the Referrals Committee. Further disciplinary action will depend on the levels of alcohol found. On an annual basis, Riders are required to declare any medication they are taking at the time of their licence renewal. Riders must also declare any medication they are taking to the testers. All Riders should note the statement issued by the Referrals Committee following hearings on 30th November 2017.
is currently happening cannot continue. There is support available for any rider who needs it and they can contact the Senior I.H.R.B. would strongly encourage them to do so”. The reports from both of these examinations will be sent to the I.H.R.B Senior Medical Officer who will then be responsible for deciding if the jockey/rider can safely be allowed to return to race riding, or if a further period of rehabilitation is required. The Jockeys Accident Fund was established in 1933 to provide benefit for professional jockeys and apprentices who are injured either during a race meeting or in the schooling of horses. In some circumstances, the fund may pay benefit to a professional rider from another jurisdiction to cover emergency costs in the event of he/she being involved in an accident while riding in an Irish race. The fund makes payments for the completion of research to benefit rider’s health and well-being. Income of the fund is derived from owners and jockey’s levies, a portion of jockeys and apprentice’s annual licence fees, stake percentages won by Qualified Riders, investment income and voluntary donations. The Qualified Riders Accident Fund was set up for the benefit of Qualified Riders licensed by the I.H.R.B. It provides benefit in the event of death or injury to a Qualified Rider while riding in a race. In some circumstances, the fund may pay benefit to an amateur rider from another jurisdiction to cover emergency costs in the event of he/she being involved in an accident while riding in an Irish race. The fund makes payments for the completion of research to benefit rider’s health and well-being. Income of the fund is derived from race entry levies, riding fees, a portion of Qualified Rider annual licence fees, investment income and voluntary donations.